Hi everyone! I'm so excited because my Modern Holiday Blog Tour starts in just a few hours right here and over at Stash Books. The theme is Christmas in July and each day one of many great bloggers will have a book to give away! (Winner inside the US will win a hard copy; outside winners will receive a digital copy.) They will all be mailed at the end of July, after the tour wraps up. The theme is Christmas in July and people will be sharing favorite quilts, fabric collections, cookie recipes, etc. I'd like to start off by talking about the quilt on the cover of the book. It is called Holiday Forest and it is our daughter's favorite. I love it too but she was really convinced this one would be the cover quilt and she was right! I think the aqua and green color palette looks lovely on the cover, with all the presents in front and the big, fluffy rug on the floor. (For those who are interested, the fabric came from a collection called Ready Set Snow by Me and My Sister Design for Moda, and there are lots of Robert Kaufman blenders in it as well, including some by Patrick Lose.) This quilt doesn't have to be made in strictly Christmas prints - choose a color palette you love and go for it! Holiday Forest features three different sizes of trees. The biggest is over 22" in height, which means this quilt is sew-able in a weekend. I don't know if you can tell but the snowflakes are appliqued with metallic thread for a little bit of sparkle. Of course you could use a Cutwork tool for snowflakes if you have one, or you could even cut them out by hand. There are 4 snowflake shapes included in the book. You could decorate the trees on the quilt with buttons or trim and keep it out the entire winter! To enter to win for this first day of the blog tour, just leave a comment on this post telling me what whether you would most like to make the quilt, pillow, or coasters and what colors you might make it in. That's it! One entry per person and the deadline will be this Friday, the 12th, at midnight. Don't forget to hop on over to Stash Books tomorrow to enter for another chance to win! Thanks so much to all these talented people for helping me out! The pillow and the quilt would be beautiful together and fun to coordinate prints with. :) Love these ideas! I love this quilt too! And would make it in blue and silver . I am excited for the Blog Hop and the release of your book! I would LOVE to make the quilt but reality right now is that I will be able to make and complete the coasters! I would make the quilt in traditional Christmas Colors and the coasters in blues and whites. All 3 projects are darling but I think I'd make the pillow and use blues and white to use as a winter pillow. I'd make the pillow and it would be in peacock and cream. I am a traditionalist, so I am thinking of making the quilt in trad Christmas colors: deep red, deep green, and gold. I'd like to make the quilt in blue and white, and maybe another in green and brown. This looks like a really fun book. Love your cover quilt! Congratulations on the book. I'd make the quilt. I like your colors, but would probably need to go more traditional due to my super traditional hubby. Thanks! I saw the cover of the book and the quilt last week. I immediately thought that I needed to make it in the same colors you chose; my favorites. But, I also thought it would be cute made up in fall colors...greens, oranges, golds, with a leaf replacing the snowflake. I'm very excited to see what the next 10 days will bring. Wishing you much success! I would make the quilt. Adorable! I'd make the pillow in traditional Christmas colors of red, green & white. Thanks. I love the trees in the quilt. That's what I would make. I have been so looking forward to this blog hop...and I love the tree quilt...I would love to make it in blue and white...I have a piece of Jason Yenter snowflake fabric left over from last Christmas and it would be so pretty made up into this quilt...thank you for being so generous. I will love to do the quilt in aqua ans reen and pink. Sort of retro colors! I'd make the quilt first, but love all the projects. I like the green and aqua and might use those colors plus a bit of red. The book looks great! Thanks for the chance. I always lean toward quilts, so that is what I would make. I would make the quilt - adore the trees! In Navy, greens and white. I would make the quilt (first!) in red, green and white - I love the traditional colours! I'd start with a pillow (or several) for sure. The easiest way to change up decor for holidays. I have a bundle of Blitzen I still need to use up! I love the quilt! What a nice quilt for the cover. I like the idea of Christmas coasters. That looks like a fast and fun project. 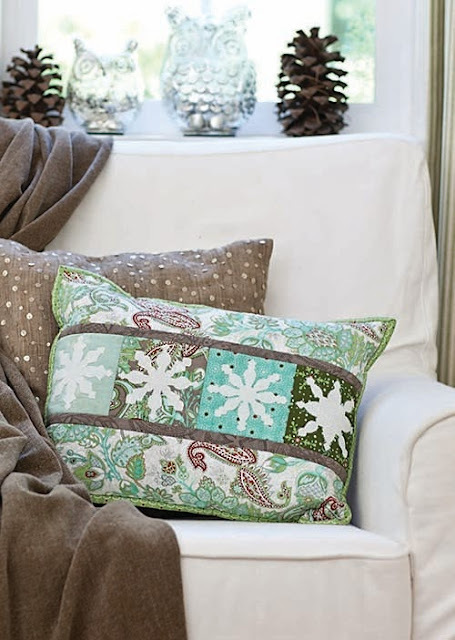 Love the quilt... it would be lovely in warm flannels and used for a winter quilt, not just for Christmas. Thanks for the opportunity to win this great book! Amanda I would make some pillows and coasters. Thanks for the chance. First item I'd make would be pillows using pastel colors of turquoise and pink - for a Florida Beachy Christmas! Would absolutely love to win your new book! I love both the quilt and pillow, but would probably make the pillow first. One of our granddaughters prefers the non-traditional Christmas colors, so they would make beautiful presents for her. Thank you so much for sharing your God given gifts with the quilting world. I'd love to make the quilt and a pillow. I would use the aqua, green and white and add a little red. I'd make the quilt using aqua, green and a few splashes of pink, my favorite colors for Christmas, thanks. I am a primitive or Civil War quilter but I really like the larger quilt and I would make that except that I probably would use more tradional fabrics which would blend with the rest of the house. I love the pillow the colors you have chosen would suit the brown leather couch we have. The quilt would also have to be made.Love the Ready Set Snow line you used. I would like to mnake the pillow , I love it , thanks for the chance. I would make the coasters. I am a last minute project person and I can imagine making the pillow and the quilt, but not finishing in time for THIS year. Then I would have something to work on over the summer. Congrats again on your book! I would love to make the pillow in wintery colors, not necessarily Christmas...that way I could leave it out longer and enjoy it more! Thanks for the chance to win! Oh my! I would love to make all of them and I love the aqua and green! Going to get the book right now! I love the quilt and the pillow and think I would make both to go on my couch. I have seen a lot of blue and white christmas quilts and think that would be a beautiful combination to do, to match my couch. I would make the quilt, in the fabric shown, as it is stunning!! I'd love to make sets of the coasters as Christmas gifts. I'd make them in blues and whites for my sister, traditional christmas colors for my step-mother, and red and lime green for a dear friend who loves that color green. I would probably make the pillow and the couch in Christmas prints to decorate my house for the holidays. I´d to make the quilt and love the fabrics you use or aqua and red. Hi, All 3 are beautiful. I would make the pillow, maybe for me and then for gifts this Christmas too! I would have to make the quilt with the traditional red and green Christmas prints mixed with some blue. Thanks for the chance. I've made a couple of Christmas quilts and they get so little use that I think making the snowflake pillows would be a better use of my holiday sewing time, and it can be out longer for winter too. 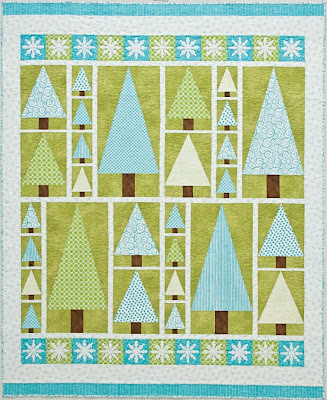 I would so make that quilt :) I love the aquas and greens and I have some left-over Blitzen fabrics. Can't wait to see all the previews. Love the wall hanging of the trees. I would usually use traditional colors but the aqua and green makes it seem like winter is giving way to a glimpse of spring. Very pretty. I would make the pillow though and use maroons and gold to go with my couch. I would make the pillow. One, I know I could complete in time for Christmas. Two, one never has enough pillows! Three, make nice gifts. Maybe not give away!! :) I tend to be traditional in color at Christmastime. I love them all. And my colors will definitely be aqua and green as those are the colors I use to decorate for Christmas with. I really love the quilt. I would make the quilt in more traditional Christmas colors: burgundy and forest green. However, the colors in your quilt are beautiful together. I could use some seasonal pillows for my new green sofa, and both this pattern and fabric are perfect. Since I don't have any Christmas coasters I would start with coasters first using Christmas Fabrics. I would then make the pillow and the quilt. I love the colors you used for the quilt so would probably use similar colors. I would make the quilt and would use red, aqua and green. The pillow looks great too. I am all in for the quilt! I am thinking a dark burgundy and a grayed lime green. I love Christmas in July! The quilt for sure, it's sooo cute! love the quilt, and especially in theses colors! I would make the quilt and copy your colors! Thanks for the chance to win! I've been excited for this book to come out! I really could make the pillow for a current project. Love the quilt too! I love them all, but my colors will definitely be red, green, and white. I will be making a slew of the coasters for gifts. I look forward to making this quilt. I will definitely add the metallic thread on the snowflakes. I love the quilt in the colors you chose, but would probably start with the coasters in traditional colors. Thanks for the opportunity to win! I like the pillow and I like the colors you have a photo of. Thanks for the fun. I need to get started with my Christmas sewing. I am just now struggling with the idea of making my first quilt- my son has chosen to make me a grandmother. But I would have to say coasters. You seem very knowledgable- do you know where Icould find a pattern for a unisex baby romper- you know the fat bottom kind with elastic at the leg holes? Thank you for all this hard work sharing. I would probably make the quilt in more traditional winter colors. I'd also make the pillow, and adapt the pattern to make a table runner. Thanks for the fun giveaway! Love the quilt! I would make it in the forest green/burgundy and cream colors. :) Thanks for the chance! I think I'd like to go for the quilt in aqua and red to hang on the wall along the stairs. I would start with the pillow, in cream and navy like snow flakes in a night sky. I like the quilt too, may cut it down to 1/4 and make a wall hanging. I would start with the coasters, to get in the mood on a hot 95+ degree day. I would like them in the same colors as the quilt to match my decor. I might even make them into mug rugs! I would make the quilt and it would be beautiful in modern greens and silver. I love the quilt and love the blue and green. I would change it up by switching white for the cream though. Not sure what colors I would use, as I haven't seen what is available at this time. I like what you have done, but may find a different plan as the new collections arrive in my LQS this season. I would love to make the quilt in dark green and sky blue and browns! I think I would make the pillow with sparkly blue and white fabrics. I'm looking forward to this hop to see the other projects in the book. I would make that quilt in super bright -- neon? -- pinks and limes. Love it! 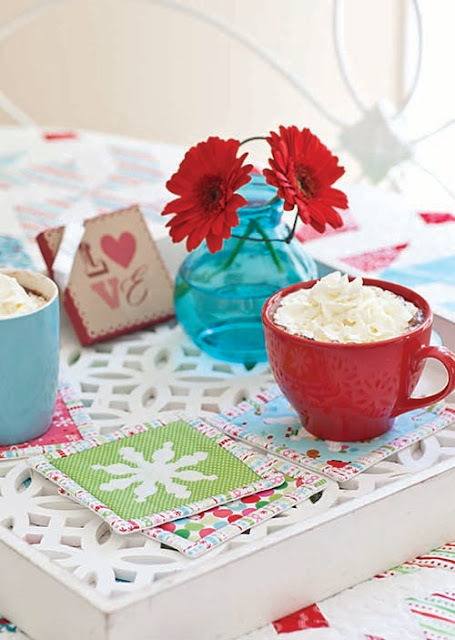 My holiday colors are pink, turquoise, and bright green, and I would love to whip up some of those adorable coasters! I would like to make the quilt or pillow in ice blues and whites. The pillow in Holiday Forest. Gorgeous! Your quilt is gorgeous and I would love to make one with similar colors. I enjoy non-traditional Christmas colors for the holidays. Thanks for a chance to win a copy of your book. I would definitely make the pillow. Not sure that I would have time this year to make a quilt, but a possibility for next year. Oooh, the book looks delicious! I would love to make this quilt, and I would make it in red and green. But they wouldn't be bright Christmassy reds and greens. They'd be more like reproduction burgandies and maybe forest greens or dark olives with a dark cream background print. I think the coasters are such a great gift idea - I'd make them in blue and silver if I made them to keep myself. More traditional colors for a gift - white or silver snowflakes with a red or green background fabric. The quilt and pillow are beautiful and I would make them in traditional colors. That is a seriously cute quilt, but I'm a total sucker for coasters! And I just bought some metallic flossast month!! I make the quilt first using a variety of reds and off-whites. Good evening! I would do a quilt and in the traditional Christmas colours: white, red and green. Many thanks for this giveaway! I think I would make the quilt and I love the colors that you used. Thanks for the giveaway. I would love to make this quilt to have in my living room for the Christmas season. I need red in a Christmas quilt so I would use the greens and teals put some bits of red. This book looks wonderful, thanks for the chance and the fun hop. I would make the coasters as gifts. The colors would depend on the receiver's color preferences. The book cover is lovely! I would love to make the quilt. I think I would like to make it in pinks and greens, festive with a twist! I love the quilt & would make it in browns & green so I could use year round. I love the quilt! Love the colors! I love the pillow. I would like to make it in silver and blues. I love the quilt and the colors are perfect that you've used! I love the pillow too! Such talent! I'd make the quilt in teal and burgundy with gold highlights. Amanda, I love the quilt and in the same colors you used! But I guess I would use red and white in mine. I would make the quilt and pillow in powder blue and a darker one, along with some white. These are my daughter's colours...I learn towards more traditional. 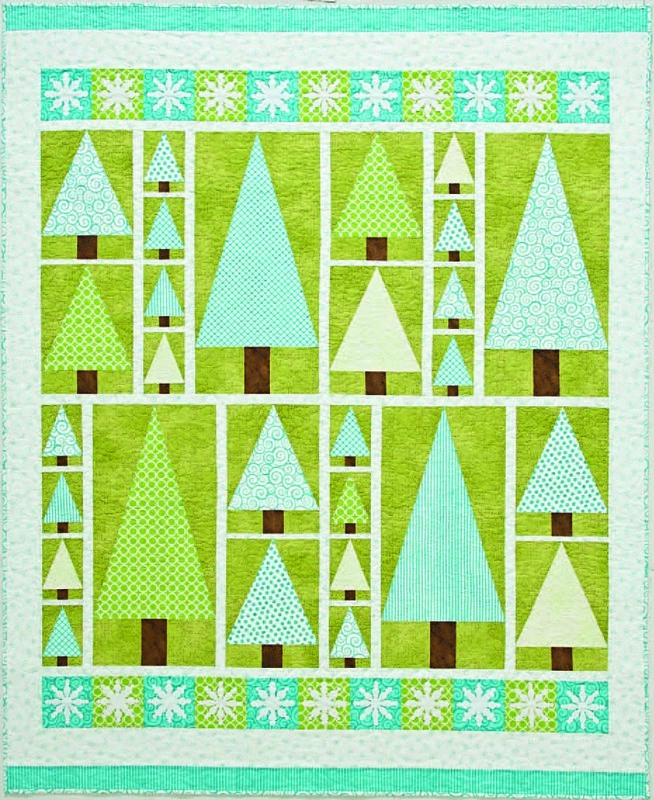 I adore the tree quilt - would love to make one. I love your colours and they would totally suit the hot Australian Christmas - no sign of snowflakes here though! But I wouldn't leave them out - a reminder of family and friends celebrating in the North! I would make a quilt and love love the colors of turquoise and green. I'd like to make the forest quilt in something non-traditional, like purple! I'LL DO SOME COASTERS IN CHRISTMAS REDS+GREENS FOR CHRISTMAS THIS YEAR! I really love the quilt a lot but, at this point in time, I would choose the coasters. I'm thinking of making gifts for the holidays of coasters and food gifts with a few other things. I know those would be made and not sit on my shelf. I think the colors I'd use would be teal, red, green and some metallic golds/silvers. The quilt is darling so that would be my choice to make. The blue/green colorway would be the colors. I so want to make this quilt because you probably won't give me the one in the photo! Right? What a lovely quilt. I would love to make it in dark greens and burgundies. It looks like a great book! I would love to make the pillow the most because I could leave it out even after Christmas. I would use silvers, teal and gray for the colors so it would fit perfectly in my living room. Love the quilt! The book looks like a lot of fun...congrats! I'd do the quilt for sure because I don't own a Christmas quilt at the moment. And I'd definitely go with the blues and greens! Just perfect! Omg! I have been a traditionalist quilter but lately am just starting to explore the more modern stuff;I must say I LOVE THIS QUILT! You are very talented. Thanks for posting. I would like to make the quilt in purples and blues. Congrats on the book! I'd start by making the pillow, and I love the fabrics you used, so would choose them, if I knew what fabric line it is! Congratulations in a beautiful book! I'd love to start with your tree quilt, as I also love the pillow and coasters, hehe. I have more of a traditional background but I'm loving the "modern" twist. The colors you used are wonderful and I'd try and find similiar, if not the same fabric. Thank you and Stash Books for a super giveaway and the chance to win. It is sew fresh to see such a Modern Christmas book! I simply adore all I have seen so far. I would love love love to be able to make the Christmas Tree quilt especially in those colours - they are suited for a hot Aussie Christmas. I am really excited about this blog hop. I would make the quilt, but might choose more traditional greens to match my decor. Love all the projects! Nice looking blog and book. I would make the coasters because they would be quick. I would use contemporary fabrics. Love the pillow with the snowflakes would make a couple of them for the livingroom couch. Thank you for having this bloghop and giveaway. Would love to make all of them. Coasters for each family member would be great. Thanks for the chance to win. Love the quilt and the pillow. I'd probably raid my stash first since i have quite a bit of Christmas fabric! I would make the coasters in black and white. I'm in a cushion making phase at the moment, so a silver and red colour would look amazing. Congratulations on your book, and thanks for the chance to win a copy! I think I would start with the coasters! I have lots of holiday fabrics, but I think blues and white would be great! Thanks for the chance to win. Wonderful book Amanda ! I would make a lap quilt in traditional Christmas colors for me and nontraditional colors for my granddaughters. Thanks for a chance to win ! I would love to make the cover quilt of trees, and I love it in the aqua and green - so different from my usual reproduction color scheme! 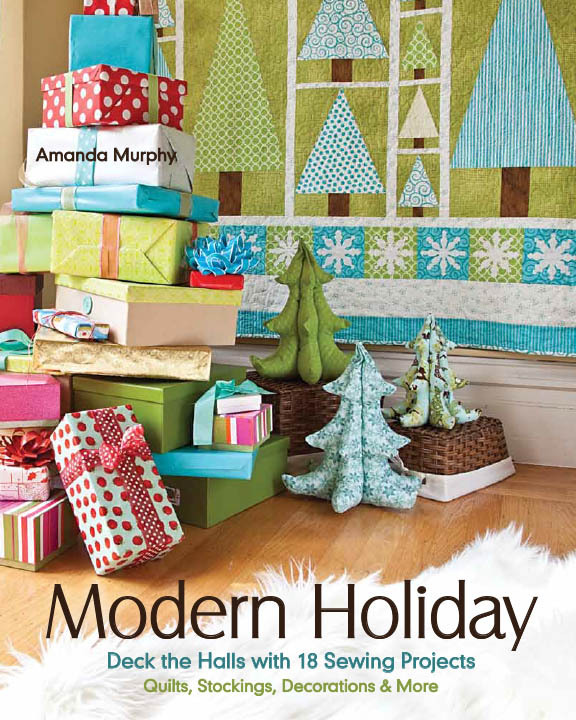 Of course that means one of my kids might steal it for their house...better make a few "modern" Christmas quilts! love the quilt most I think, although they are all just adorable! I think I would love to make it in red, white, and aqua! I'd love to make the quilt! Ad that means I'd have to go fabric shopping! I love that quilt!! Thanks for the giveaway. This book is really awesome! Thank you for the chance to win. I would love to make the quilt and I think it would be gorgeous in reds and greens. I love the quilt and the other Christmas items. But I would definitely make the quilt in colors of red and green. I know that is typical Christmas colors but that is what I like during that season. I would so make the quilt. Silver and Gold are the colors I would use. I really like the pillow nk I would make tht one in navy blue and white. Looks like a lovely book. I would make the pillow. Maybe a few of them as gifts. I would like to make the quilt and pillow to match. I think I would use turquoise and green with a pale lavender as a background with the trees. Oh I really love this quilt. i am working on a snowman quilt, so I would like to make the snowflake pillow in blues and greens to go with it. I love the coasters, they are so cute and useful. I can easily whip up a bunch of these for friends and family. I love the red/green combo, but I'm sure some of my friends would also love blue/white. I need coasters so badly and this would give me an excuse to make them! Pink, turquoise and green would be my color way. I would make the Tree quilt! I would use soft shades of green for the trees. I would make the quilt, probably to match our drawing room, as it is stunningand looks a 'quick' makeas ialways underestimate how much time I have til Christmas. I would copy cat your quilt and colors as it's just beautiful! I love all three but I would start with the coasters. A couple sets for me to keep and a few sets to give as gifts! I love bloghops and this one looks like lots of fun. I would definitely make the coasters in purple, green and silver. I would make the snowflake in silver and the background in greens and purples. I kind of like the color palette you've chosen. It's quite nice. Or perhaps change up the green to include various shades of evergreen to reflect the trees here in the northwest. I would LOVE to have pillows on my couch this year with those exact colors - it's gorgeous! I love Christmas in July. congrats on your book Amanda! I would LOVE to make the quilt and I'd do it in similar colors, my daughters would just have to draw straws for it! CONGRATS on the new book, looks wonderful - & thanks for the chance to win! I would really love to try the quilt. I'm still a (very much) newbie, but with the larger pieces I don't think I'd too much trouble. And it is soooo very pretty!! I think I would make a bunch of the coasters to give in sets as teacher gifts! I love love love snowflakes so I would probably be drawn to the pillow first that I'd loved to make in a nice cool blue background with lovely white flakes to keep it cool and cold! I'd love to make those coasters in a blue and silver colorway :) Thanks! I am looking for a new quilt for my bed and love the colors of this one. I would love to make the trees cover quilt. I love the colors of this one, but also saw some flannel with cool winter patterns including snowflakes at my LQS. I would def ma ke the quilt with a variety of green and white patterns! It is tough to choose just one but I would make the quilt. It would look fantastic on the really tall and big wall of my great room. Which colors? Hmmm. I think Blue, White and Silver would be beautiful together. I love that pillow! Those colors would match my living room. Or even a dark deep red. Thank you!! Your quilt is gorgeous, Amanda! I love the simplicity of it! I would love to make some of the beautiful pillow. Thanks for sharing. The pillow would be fun to make - although all the designs are attractive. I realize looking at the pillows that I like the idea of having different holiday pillows. I'd make in traditional red, green and white! Thank you for putting my name in the hat for this special drawing. I would love to make the quilt. I'd love to add some aquas. I would make the coasters first!